Poems based on Newcastle University research into ‘getting out’ and well-being in later life have been launched on one hundred Go North East buses as part of the Great Exhibition of the North. The poems, by award-winning Newcastle-based poet Anna Woodford, are included in her new poetry book Changing Room which is available online as well as along the Exhibition trail. 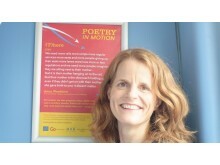 Anna is writer in residence at the Co-Motion project at the Universities of Newcastle and York which is a three year study looking at the link between mobility and well-being of 96 older people in Northumberland, York and Leeds. The study found that people’s attitudes to their mobility was a key factor in determining their well-being. Researchers also found that the wider attitudes and behaviour of the public greatly impact on the mobility of older people in the area. 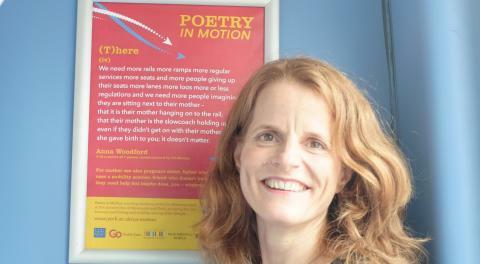 Anna Woodford said: “The poems are about encouraging people to be kinder to their fellow travellers. I’m thrilled to have them on local buses and in my new book Changing Room which is available in the BALTIC shop as part of the Great Exhibition of the North. The poems featured on one hundred First York buses last year.